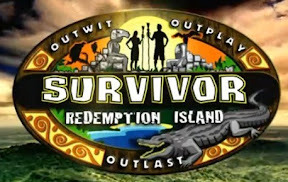 Survivor is back! With probably the most gimmick-ridden season ever! Losers get to come back! Duels! Russell participates in what may be his 12th season! Rob is back for what may be his 14th season! And there are some other nameless, faceless people playing too! Actually, that's unfair, as it was quickly clear that this season at least has better personalities than last season. Huzzah! Kristina on Team Rob showed her mojo by pulling a Russell and just finding an immunity idol without a clue. And "former federal agent?" Phil (yes, the producers included the question mark, which was awesome) was instantly annoying. Team Russell won the first immunity challenge. Kristina immediately started plotting using her just-found idol to blindside Rob. For his part, Rob started plotting to get rid of Kristina. Muwahahah! At Tribal Council, Phillip played the "former special agent" card and dropped the bombshell that Kristina has an immunity idol, blowing her plans. Rob demanded the idol in exchange for not going home. Kristina refused. Already this is better than last season! In the end, Kristina's accomplish Francesca was voted out ... to Redemption Island. Next week: Russell finds a new rival, Phillip is still crazy, and Fran duels to stay in the game.